From the time of the death of the Prophet (saws), Muslims have struggled towards consensus on an array of theological issues. While rooted in scholarly ambition,these debates have helped cast a long history of intra-Muslim violence. On several occasions the Qur’an invokes the injunction, “enjoin what is right and forbid what is wrong.” Many Muslims have taken this to be a physical command and have and continue to persecute those that they deem kufr (formal unbelief), whether manifested in physical acts of violence or more deeply rooted battles for legitimacy. In a lasting reality of variations of the “right,” can there be room for each community’s interpretation? 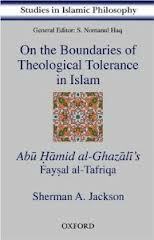 Sherman Jackson’s, On the Boundaries of Theological Tolerance in Islam, an introduction to and translation of al-Ghazali’s Faysal highlights a classical text to explore the theological boundaries of tolerance within Islam. The framework set forth is, as Jackson puts it, an “ecumenical” one by Ghazali that seeks not for the legitimizing or ranking of theological truths but rather the task of defending persons and communities against charges of unbelief though establishing a method for determining what constitutes unbelief. No matter how “out there” you might consider a community’s interpretation it does not necessitate the claim of kufr. Jackson’s introduction, as many have noted, is as equally important as his translation. In it, he guides the reader through Faysal and offers a historical and contemporary context through which to read and understand Ghazali’s aim. In writing Faysal, Jackson notes that Ghazali is responding to the “extremist,” the theologians that offer too narrow of interpretations and second, the “zanadiqa,” the crypto-infidels that occupy the outer-limits, the philosophers. It’s important when reading to remember that Ghazali is not here for the right or the wrong, but is about making space for tolerance among Muslims varying in scriptural interpretations. Ghazali outlines that the kufr are those that “deem anything the Prophet brought to be a lie, just as iman is to deem everything he brought to be true” (46). So, for example, that would be denying the existence and oneness of God, the Prophet, and the Last Day. No matter how “out there” you might consider a community’s interpretation, if there is no legitimate charge of takdhib, it does not necessitate the claim of kufr. Though the constitution of kufr seems simple enough, Ghazali understands that this will not prevent the Hanbalite from branding the Ash’arite an unbeliever and the Ash’arite claiming the Mu’tazilite an unbeliever and so on. To give clarity, Ghazali then goes into great detail regarding the meaning of “deeming to be a lie (takdhib)” and “deeming to be true (tasdiq), “ “and the reality of how these designations apply to statements by the Prophet.” The text at this point, albeit brief, can become a bit technical and not so easy for the casual reader as he discusses the 5 levels of existence (wujud)–(a) dhati (ontological) (b) hissi (sensory) c) khayali (conceptual), d) aqli (noetic) e) shaboli (analogy)–that one must go through in determining a statement takdhib. But if you can get through it, it’s well worth the read.